Explanation: A rival to vanquished Comet ISON in 2013, Comet Lovejoy (C/2013 R1) still sweeps through early morning skies, captured in this starry scene on New Year's day. The frame stretches some 3.5 degrees (about 7 full moons) across a background of faint stars in the constellation Hercules. Only just visible to the naked eye from dark sites before dawn, Lovejoy remains a good target for the northern hemisphere's binocular equipped skygazers. 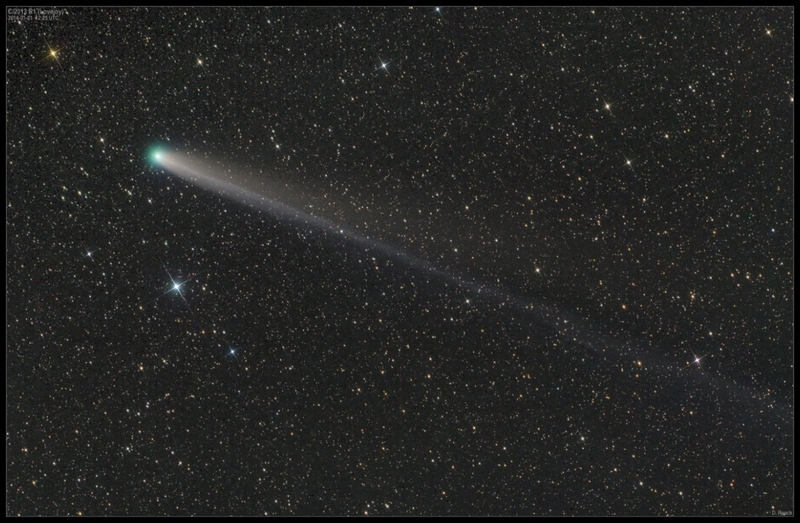 But this deep exposure shows off Lovejoy's beautiful tails and tantalizing greenish coma better than binocular views. Not a sungrazer, this Comet Lovejoy made its closest approach to the Sun around December 22, looping high above the ecliptic plane. Now headed for the outer Solar System, Lovejoy began the new year about 6.7 light-minutes from planet Earth.